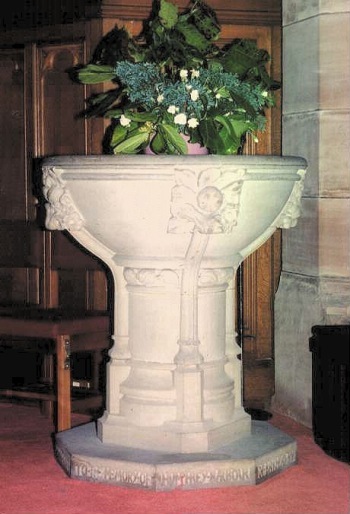 Kilbarchan West Parish Church and the font of Hexham stone presented in November 1902 with the inscription "to the memory of Humphrey Barbour of Bankhead by his grandsons George Barbour of Bolesworth and Hugh Barbour of Gryffe". 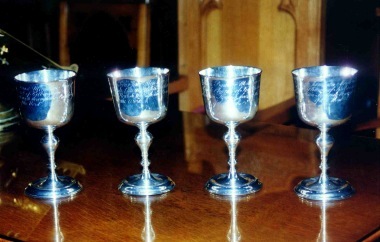 The communion cups were presented to the church in 1762 by John Barbour, his brother William, brother- in-law William Stuart, and Hugh Jamieson of Kilbarchan and Manchester, and are inscribed "Lord let Kilbarchan flourish through the preaching of the Word". 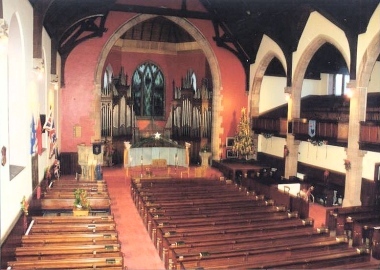 Photographs courtesy of John Borland and Alex Graham of Kilbarchan.